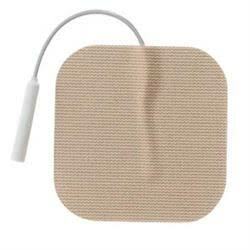 Electrode patches measures 2 inches x 2 inches. Durable, economical, and flexible Re-ply solid gel electrodes are reusable, self-adhering and easy to apply and reposition. Featuring soft tricot covers and a low profile design. Re-ply electrodes offer multiple applications from 10-15 days. Sold by package, 4 electrodes per package.